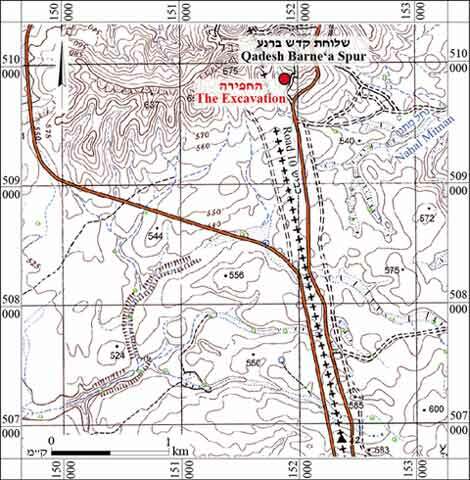 In January and February 2012, a salvage excavation was conducted along the Israel-Egyptian border, south of Sheluhat Qadesh Barne‘a (Qadesh Barne‘a Spur; Permit No. A-6387; map ref. 151917/509440; Fig. 1), prior to the construction of a new border fence. The excavation, undertaken on behalf of the Israel Antiquities Authority and underwritten by the Ministry of Defense, was directed by T. Erickson-Gini (photography), with the assisted of A. Freiberg (field supervisor), A. Hajian and M. Konin (surveing and drafting), E. Belashov (plans) and N. Porat from the Geological Survey of Israel (OSL). 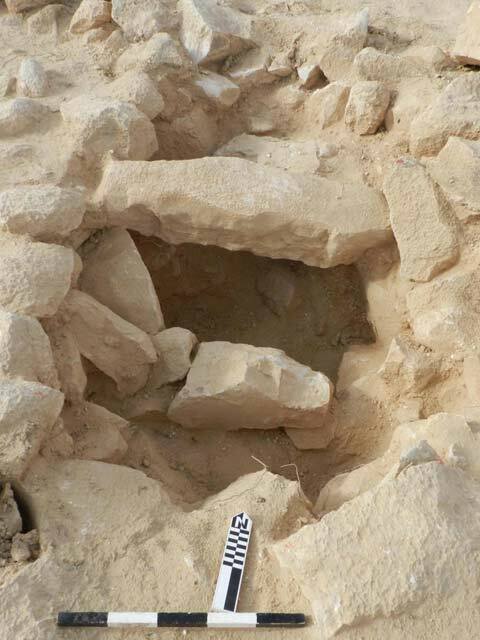 The excavation was conducted in a plain west of Nahal Mitnan, in several sites documented in a survey undertaken in 2010 and 2011 (License No. S-223/2010; Figs. 2, 3): two clusters of cairns, a northern one (Nos. 102–104) and a southern one (Nos. 107, 108, 110, 111); two line temples (free-standing walls [length 10–30 m], possibly cultic structures; Nos. 97, 105, 106; No. 106 was only documented during the excavation); one campsite (No. 125); and one grave (No. 160; not shown in Figs. 2, 3) located c. 500 m south of the campsite. The cairns and the line temples date, based on OSL samplings, from the Early Bronze Age or even earlier. 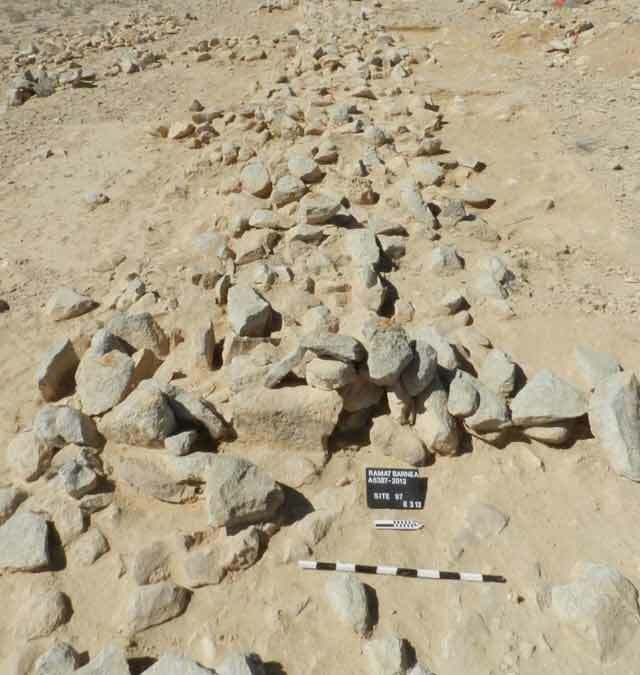 The vicinity of the excavation and the area further west, extending toward the ancient site of Qadesh Barne‘a (Tell el-Qudeirat), situated 6 km to the southwest, beyond the border with Egypt, is dotted with numerous cairns, line-temples and other structures and installations. 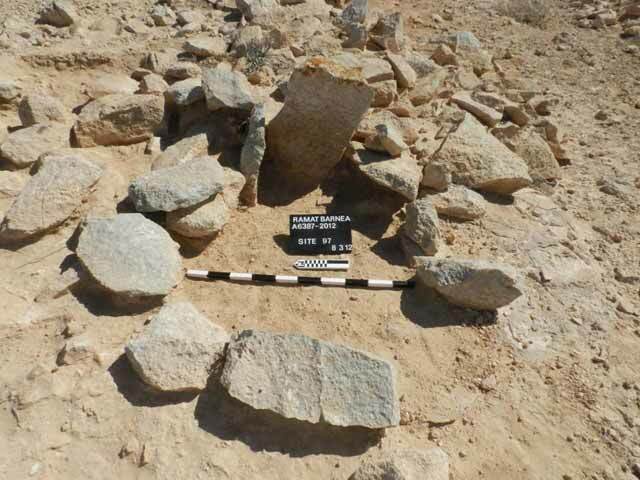 Nelson Glueck (1965) was the first to document a cairn field in this area, and several additional cairn fields were identified and excavated in 1982, as part of the Negev Emergency Survey (Haiman 1992) conducted prior to returning the Sinai to Egypt. 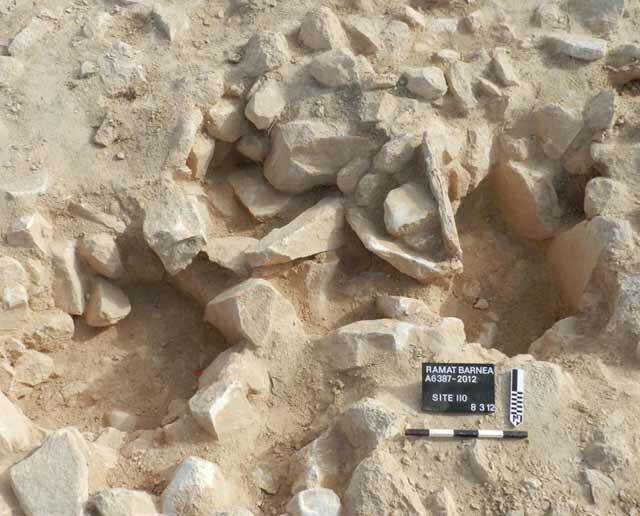 The area of the current excavation comprises the eastern part of the Nahal Mitnan cairn field (Site 7; Saidel and Haiman 2014:19–23, Figs. 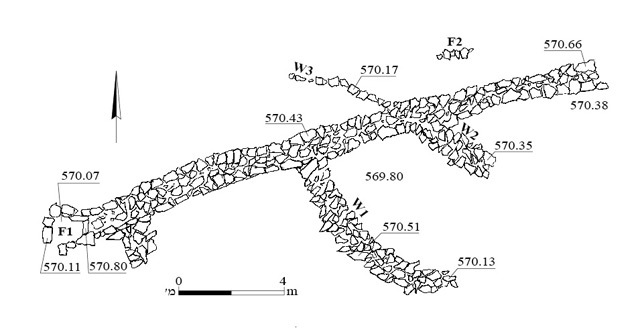 2.30, 2.31), where numerous cairns and seven line-temples, as well as pottery from the Early Bronze Age II and the Intermediate Bronze Age were unearthed (Haiman 2014:21). Cairns. 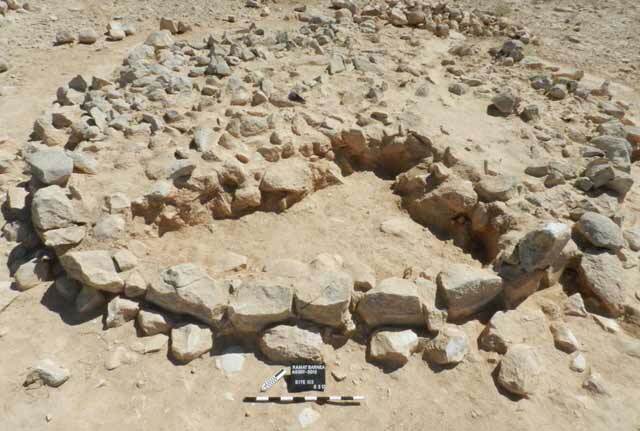 Seven rounded cairns located in two clusters were excavated: Cairns 102–104, comprising the northern cluster, were set along an east–west axis; and cairns 107, 108, 110 and 111, the southern cluster, were set along a north–south axis. Five of the cairns (102, 103, 107, 108, 110; diam. 7–11 m, height 0.7–1.0 m; Figs. 4–10) include an external wall built of roughly cut stones (average dimensions 0.20 × 0.50 × 0.85 m), which delimited a fill of soil and smaller field stones. 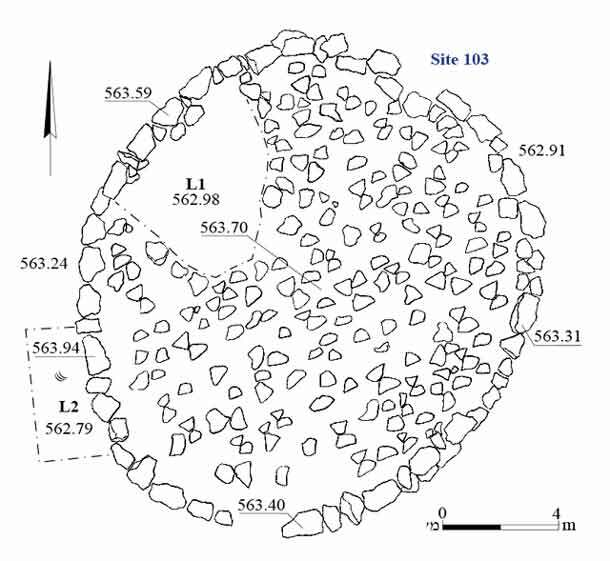 A rounded burial cell was discovered at their center, except for cairn 103, where no cell was preserved, and for cairn 110, where two small burial cells (depth 0.35 m; Fig. 11) were discovered. 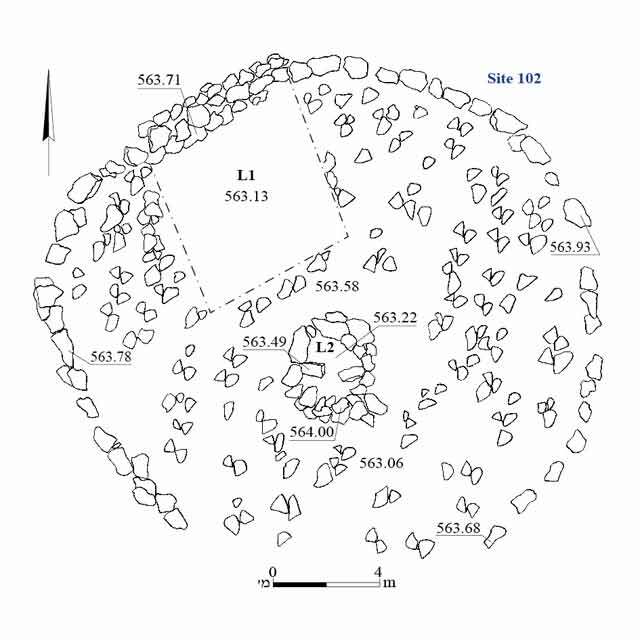 The burial cell (1.0 × 2.1 m, depth 0.35) in cairn 107 was covered with rectangular stones found in situ (Figs. 12, 13). The remaining two cairns, 104 and 111, are small (diam. c. 3 m, height 0.5 m; Figs. 10, 14, 15) and appear to be simple burial cells. All the burial cells were robbed, apparently in antiquity. Line Temples. Three east–west walls (Nos. 97, 105, 106), identified as line temples, were discovered in close proximity to the cairns. Wall 97 (length 21.5 m, width 1.1 m, height 0.65 m; Figs. 16, 17), the only one that was completely excavated, was built on a bedrock shelf. It was formed by two lines of large–medium stones (c. 0.25 × 0.35 × 0.60 m), set 0.85–0.95 m apart, with a fill of soil and small stones between them. The wall’s stones were quarried in bedrock outcrops near the site. Wall 97 ended on the west with a large stone, but no similar stone was found on the east end. In a later phase, three low walls (W1–W3; preserved height 0.4 m) were built against W97, evidently in order to provide enclosures or shelters from wind. Wall 1 appears to be part of an enclosure that connected with W2. Likewise, a small circle of stones (F1; diam. c. 1.5 m; Fig. 18) was built in a later phase at the western end of W97. 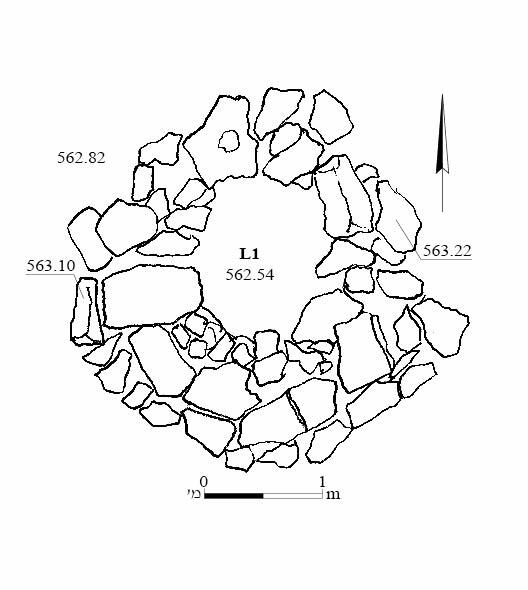 An OSL sample from below one of the stones of Circle F1 indicates that it was constructed c. 1200 CE. A line of stones (F2; length 2.1 m) was built parallel to W97, to its north. No finds were discovered in association with any part of W97 or the later walls. Wall 105 (length 26.5 m, width 0.9–1.0 m, height 0.6 m; Figs. 19, 20) was explored in a small probe at its southwestern end (Figs. 21, 22). Like W97, W105 was built of large stones (0.25 × 0.55 × 0.90 m) laid directly on the bedrock. Wall 106 (length c. 21 m, width c. 1 m; Fig. 23) was not excavated; its construction is similar to that of W105. 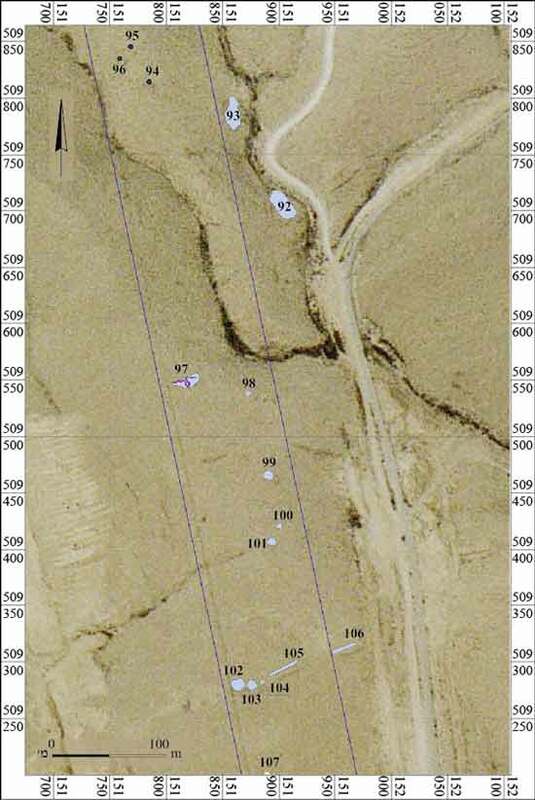 The east–west orientation of the three line-temple walls matches the orientation of similar walls excavated in 2011 at Site 88, c. 11 km northwest of the current excavation, west of the settlement of ‘Ezuz (Permit no. A-6307). Campsite. An oval area (No. 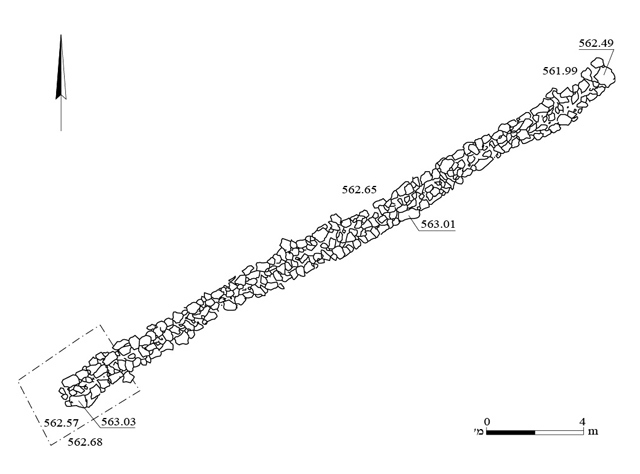 125; c. 15 × 20 m) cleared of stones may have been used for encampment. A rough circle of stones was built inside the campsite (diam. 2.1 m; Fig. 24). No finds were discovered at this site. Grave. A single grave (No. 160; 1.0 × 1.7 m; map ref. 152190/508025; Fig. 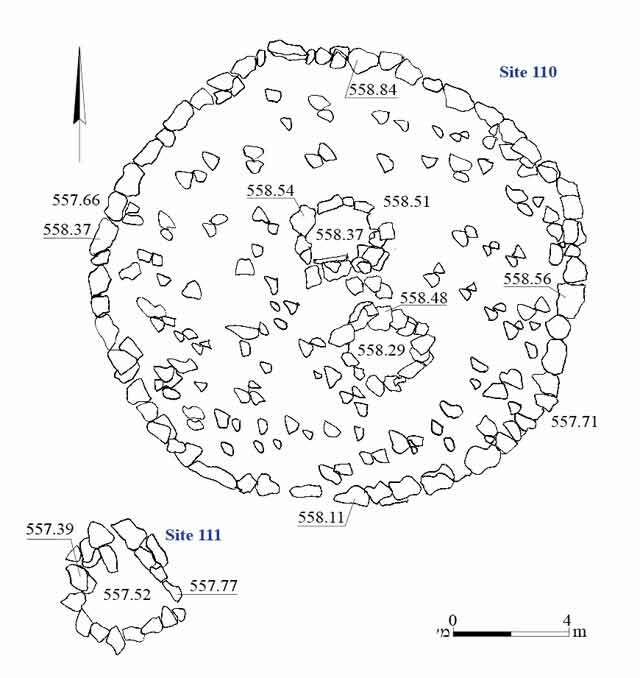 25) built of a circle of standing, large–medium fieldstones delimited a pit (depth 0.4 m) dug in the ground. The pit was lined and paved with stones, and covered with three rectangularstones (Fig. 26). Optically Stimulated Luminescence (OSL) Sampling. In lieu of radiocarbon sampling—as no organic material was revealed in the excavation—sediments associated with the exposed remains were sampled for OSL dating. The OSL method dates the last exposure of quartz grains to sunlight, i.e. when the quartz grains were last transported and deposited in or below a structure. Dating the deposition of sediments, which occurred either prior to the building of a structure or after it had fallen out of use, could provide the ante quem and post quem dates for its construction and use. 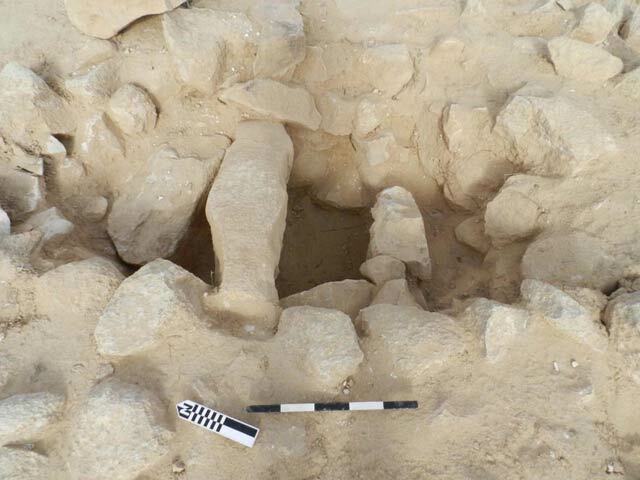 Six of the excavated sites were sampled, with one to three samples collected from each site (Nos. 97, 102, 103, 105, 106, 108; Table 1; for more detailed results, see Appendix; Porat et al. 2006). Of the eleven measured samples, four results seem to represent the post quem dates. They range from 13,000 to 8600 years BP (11,000 to 6600 BCE), and they come from the underlying loess deposits that covered the slopes at the time of construction. Interestingly, no loess covers the slopes today due to long-term erosional processes. The remaining seven—ranging from 6300 to 800 years BP (4300 BCE to 1200 CE)—provide ante quem dates for the sampled structures. Three OSL results provide ante quem dates that cluster between 2800 and 2500 BCE; they come from Cairns 103 and 108 and Line Temple 106. However, the three line temples—all located within the cairn field and sharing the same construction techniques and orientation—produced three discordant ante quem OSL dates (No. 97—1300 BCE; No. 105—3400 BCE; No. 106—2500 BCE). 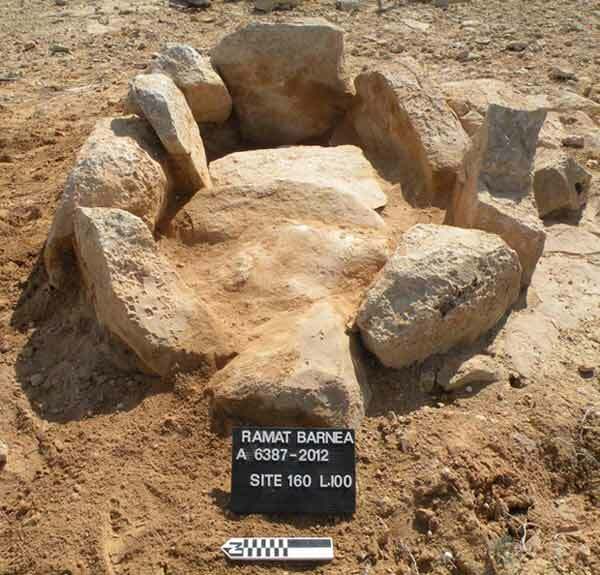 Thus, the OSL sampling results suggest that a greater number of samples is needed for sites like Ramat Barne‘a, especially for identifying the oldest dust deposited from immediately after the various features were abandoned. *Ante quem dates are marked in bold, and post quemdates—in italics. The excavation area consisted mainly of a cairn field and associated line temples, which have been tentatively dated to the Early Bronze Age, but are possibly earlier. A campsite and a grave were also excavated south of the cairn field; their date could not be determined. 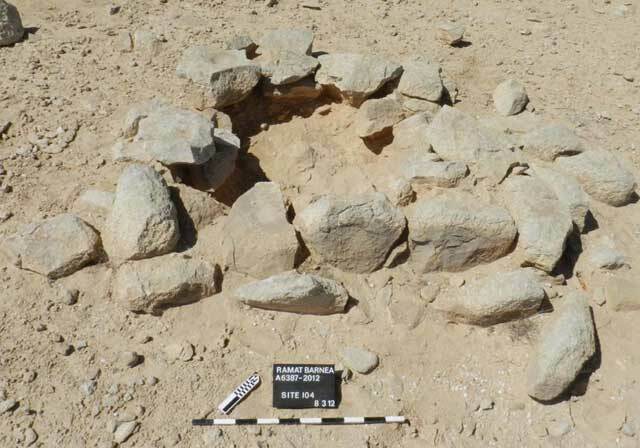 According to Haiman (2014:173), no fewer than 20 cairn fields, with a total of 600 cairns, have been surveyed in the area of ‘Ein el-Gudeirat (‘Ein Qudeirat; ‘Ein Qadis) near Qadesh Barne‘a (Tell el-Qudeirat). 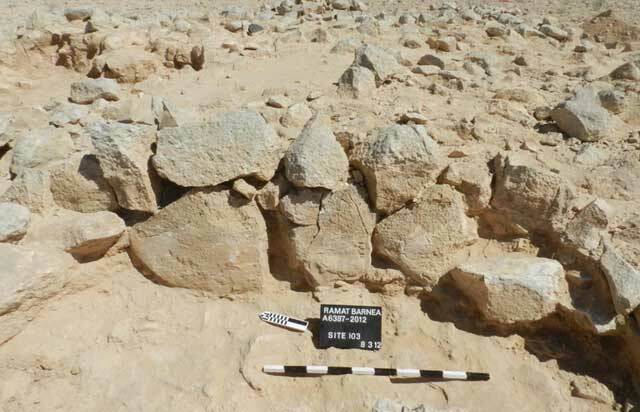 Like the cairn field in this excavation, several of these cairn fields include line temples. Haiman attributed the presence of the cairn fields to widespread settlement in the Negev Highlands and southern Sinai in the Early Bronze Age II, a date based on correlations with Early Bronze Age Tel ‘Arad (Haiman 2014:171). Other researchers proposed an earlier date. 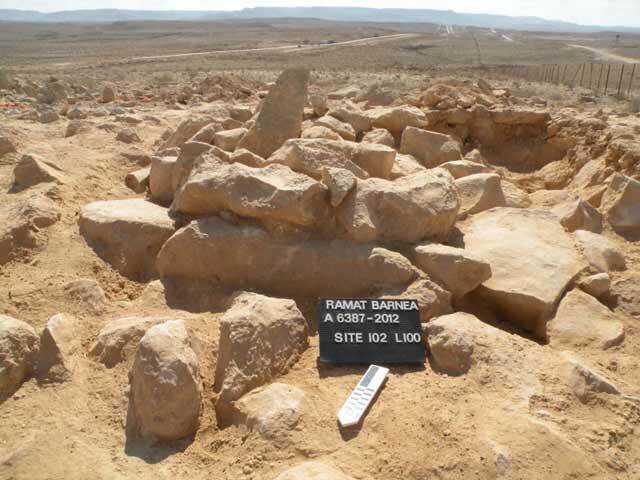 Yekutieli (2005:169), for instance, has noted similarities between the cultural sphere of the Negev Highlands—manifested in cairn fields, ‘pen and room’-style architecture and holemouth-dominated ceramic assemblages—and a “consistent component of Egyptian objects of the Naqada III/Dynasty 0–1”. Glueck N. 1965. Further Explorations in the Negev. BASOR 170:6–29. Haiman M. 1992. Cairn Burials and Cairn Fields in the Negev. BASOR 287:25–45. Haiman M. 2014. 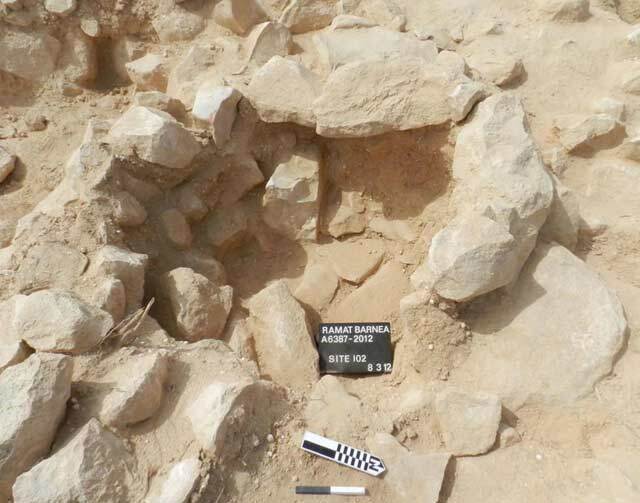 A Synthesis of the Early Bronze Age II in the Negev and Sinai. In B.A. Saidel and M. Haiman eds. 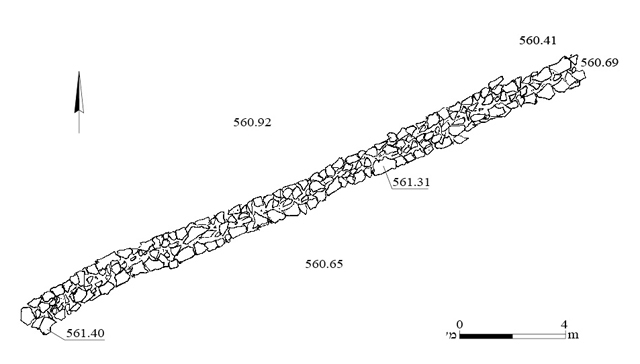 Excavations in the Western Negev Highlands: Results of the Negev Emergency Survey 1978–89 (BAR Int. S. 2684). Oxford. Pp. 171–175. Porat N., Rosen S.A., Avni Y. and Boaretto E. 2006. 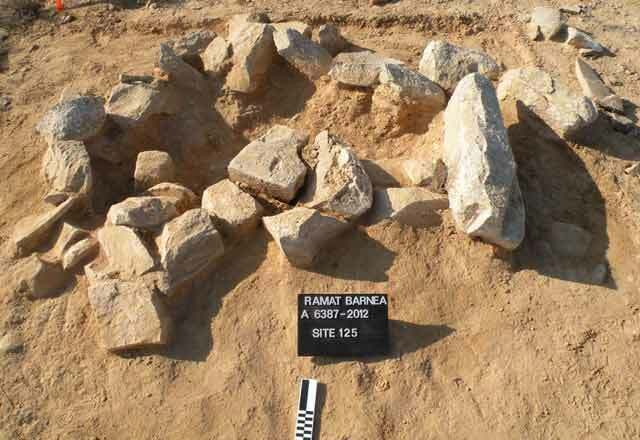 Dating the Ramat Saharonim Late Neolithic Desert Cult Site. JAS 33:1341–1355. Saidel B.A. and Haiman M. eds. 2014. 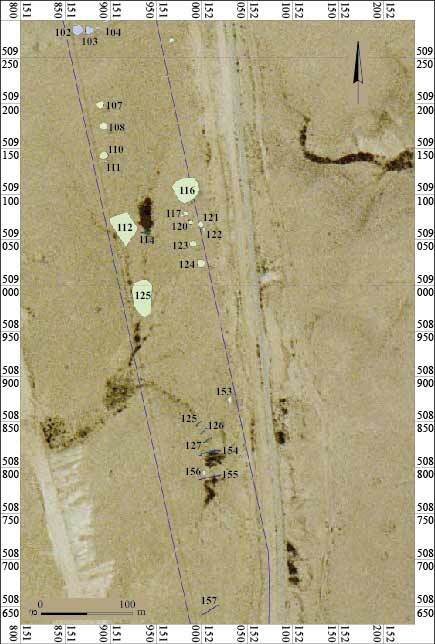 Excavations in the Western Negev Highlands: Results of the Negev Emergency Survey 1978–89 (BAR Int. S. 2684). Oxford. Yekutieli Y. 2005. The Desert, the Sown and the Egyptian Colony. Egypt and the Levant 14:163–171. 5. 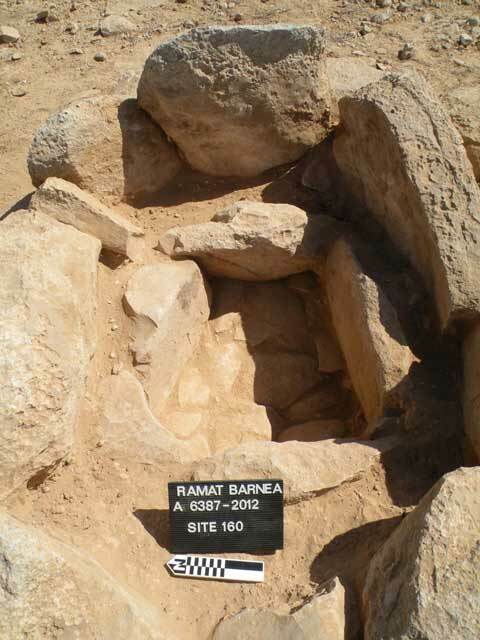 Burial cell in Cairn 102, looking southwest. 6. 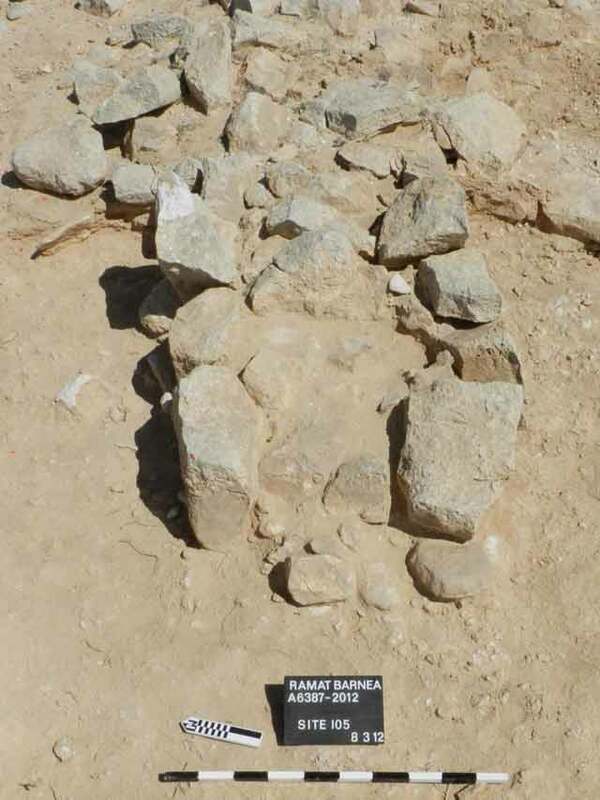 Burial cell in Cairn 102 after excavation, looking southwest. 8. Cairn 103, looking southeast. 9. Exterior wall of Cairn 103, looking east. 10. Cairns 110 and 111, plan. 11. Two small burial cells in Cairn 110, looking south. 12. Burial cell in Cairn 107, looking east. 13. Burial cell in Cairn 107, looking north. 15. Cairn 104, looking northeast. 16. Line Temple 97 with later walls, plan. 17. Line Temple 97, looking west. 18. A round circle (F1) at the western end of Line Temple 97, looking east. 19. Line Temple 105, plan. 20. The southwestern end of Line Temple 105, looking northeast. 21. Northern face of Line Temple 105, looking south. 22. Southern face of Line Temple 105, looking north. 23. Line Temple 106, plan. 24. Installation in Campsite 125, looking south. 25. Grave 160, with cover stones over the burial pit, looking east. 26. The pit in Grave 160, looking east.